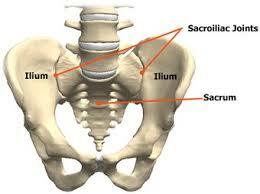 This one covers it all for what could be causing some of your low back pain especially at your sacroiliac (SI) joint. This is a great video because he breaks down not only options on how to fix it but also how to work on your motion and movement to help prevent you from getting pain in this area in the first place. Mobilization: You can't just look at the back muscles for this one. Work on your glutes, especially your piriformis and it could be pulling you out of position. Don't neglect the powerful hip flexors in the front of your hips as they can pull you out of position and increase tension on your low back as well. Movement: Don't take basic movements for granted like sitting down. If you don't prep your body to move through good ranges of motion you are setting yourself up to put tension and pressure where it shouldn't be and that can add into your low back pain and put extreme forces on your SI joint. Take the time and try some of this stuff out. Minimal effective dose is 2 minutes on what you're working on. Now isn't that worth reducing your back pain?